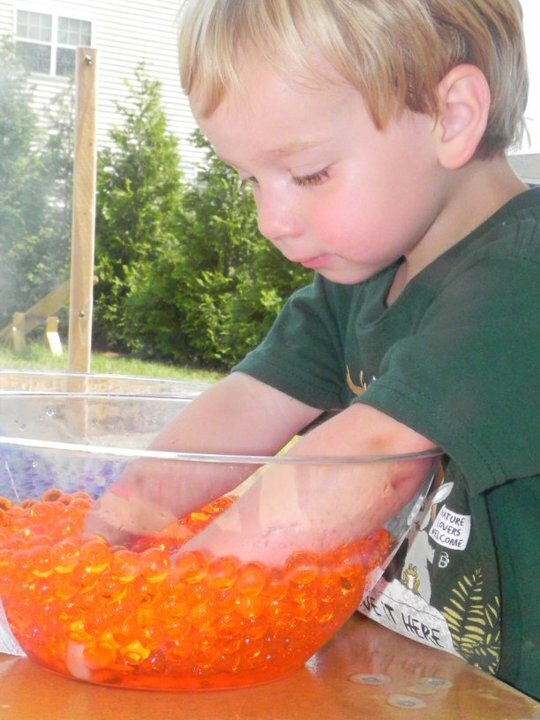 Play At Home Mom LLC: Water Beads - the post that started a CRAZE!! 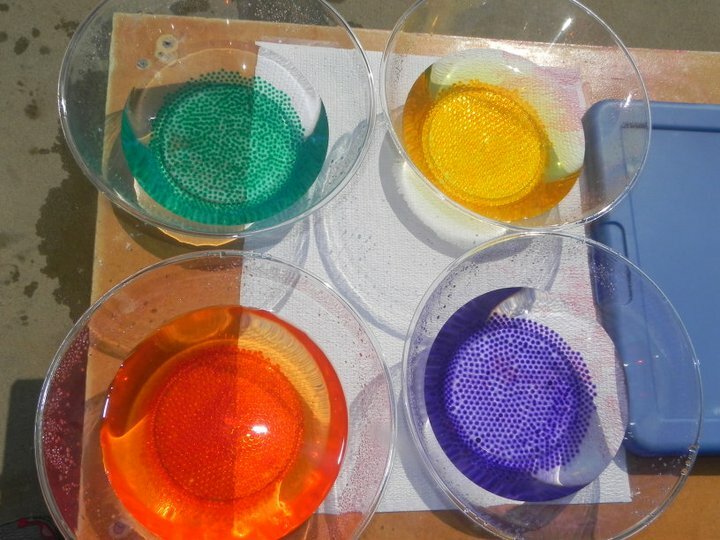 Water Beads - the post that started a CRAZE!! They look amazing on the light panel!! 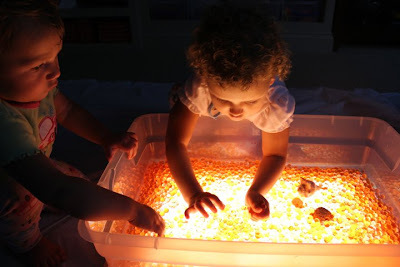 Of all the things we have explored in the sensory table, this is by far his favorite to date....and believe me, we have put A LOT of things in the sensory table. We had to get more colors today! FUN! Hooray, you have a blog! I've been wanting to get these water beads since the moment I saw them on your FB page. The look fabulous. Love the light table combination, as well! I really want my husband to build a light table for us!!! Thank you for sharing all your fabulous ideas! After I saw this on your FB, I posted pictures of my Love Bug playing with them - all of my friends with kids have gone out and got them. I see Water Beads sales everywhere sky rocketing! I have to ask what exactly are these made of? What is the source of the coloring? I have looked around and it seems that I can only find chemical companies as the sources of man-made polymers. The same material that contact lenses are made of. I can offer you a great deal on these. Our Deco Water Pearls use a better quality materials than those you see in the stores. We have purchased them at all the retail outlets we have seen them at and ours are more durable. Our price is a little higher for small quantities but I can offer a great price on bulk orders. Ours also do not bleed, ad will last 2 years or more, they can be left to dry out and they will go back to original size and can be rehydrated and iin turn used over and over again! We included this activity in our 'treasury' of unique sensory play ideas at our blog, MPM School Supplies Blog! We were sure to give photo/idea credit, as well as a link back to your site, but we'd love your feedback! has anyone else had them go moldy? I don't know if it is just my house or if it is common...how about slimy? After a day or so they seemed slimy. I just had that problem. Did you figure out a way to prevent it? I did this today with my 21m old. Her first response was to methodically pick up each bead and squish it to smithereens. Then, she stripped off all her clothes and diaper and climbed in!! She loved it! 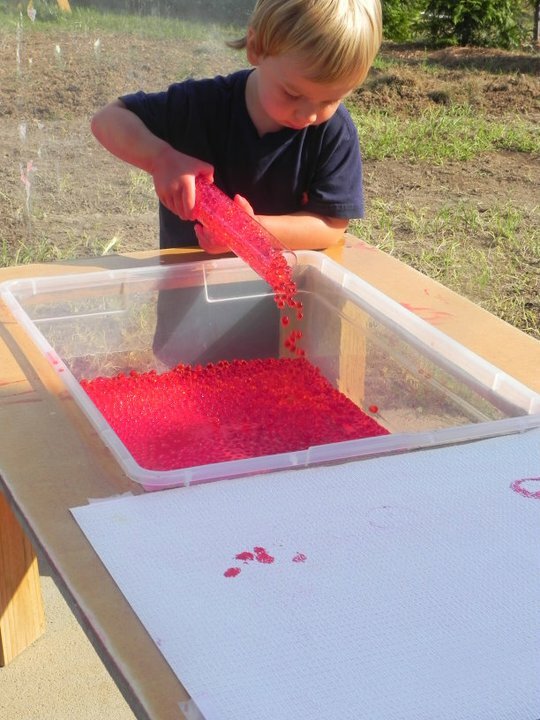 Boy do those little balls bounce all over when excited hands slosh them out of the water table! Thanks for sharing. I love your blog! I have found that I can't leave them outside (in the heat) or they do get a bit "off". WHat seems to prolong their lifespan is if, after playing with them, I bring them inside, dump them into a colander, and rinse them off with clean, cold water, as well as rinsing out the bin. 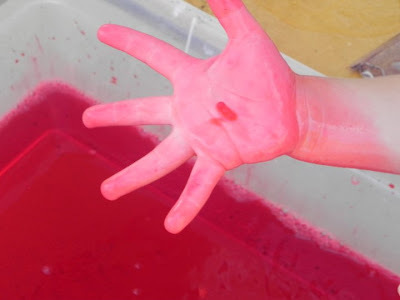 It seems to help get rid of the dirt and debris from all of those little (and big) hands. We don't have a light table, but a great way to play with these at night is to get a few of the ball-shaped, battery operated submersible LED lights. It getting darker earlier here, and this has been a huge hit in the neighborhood when I bring them out! I just started a blog about my play explorations with my baby boy... please tell me what you think! 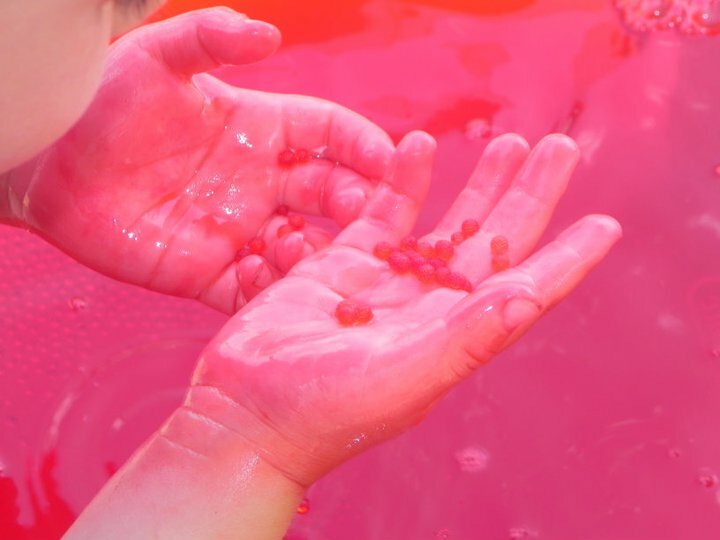 We tried these water beads over the summer and they were great even for the grown-ups to feel. Wonderful therapy for arthritic hands. Again we hydrated some more for her birthday party last weekend. The kids loved feeling, mixing colors, smashing, bouncing, adding more water, etc. Many thanks for the inspiration. After our first play time with them - we kept them hydrated for a week or two. Then it took well over a week to dry them all out in the sun on cookie sheets. Do you have any suggestions on drying them out to store for another time? I found some at walmart but it has a warning on it that says they contain chemicals known by the state of california to cause cancer, birth defects and other reproductive harm. Yet they also say non toxic. Are these really safe for kids to play with? It looks like so much fun, but the warning has me worried. So...I don't have the money for a light table. I also don't have the time or the inclination to make a proper light table. Instead, I used a "clear" 14" x 24" storage container with a "clear" lid. I secured two tap lights (the little lights that you can put anywhere because they're battery operated) to the bottom with adhesive that comes with the lights. My 2-year-old daughter doesn't know that she's playing with the poor man's version of a light table...she just knows that we're doing something we've never done before and we're spending more quality time together than we ever have. I'd say that's pretty priceless! If you are worried about ingestion, how about cooking up a pot of big tapioca balls? Do these sensory balls last a while or are they a one time time thing and then you have to throw them out? 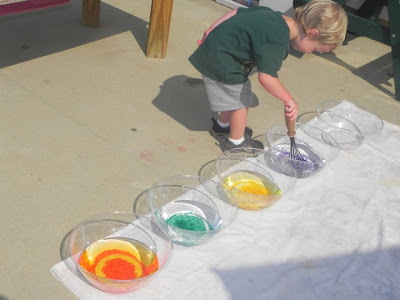 i work at a day care with 18-24 months olds are the beads ok for them to play with? How do you keep the beads clean for multiple use by multiple children and avoid any mold or mildew growth? Just wondering before we invest in these. Rinse, drain, store in an open container and rehydrate as needed. You can also add some lavender oil which acts as a natural antimicrobial. Yes, washing is the key, especially when people are touching them a lot. I have numerous school teachers using these as educational tools in the plant side (watch the roots grow) and my son loves to watch his expand and contract. I add battery operated tea-lights to the water beads. I love the look! I love the way your explored color and water in this post. I purchase some water beads 5 days ago from this site and was wondering when they would be here? Thanks!